Infants can only breathe through their nose for the first portion of their infancy. When your baby has a cold, the nasal passages get swollen and mucus collects in the back of the nose. This environment is a breeding ground for the bacteria; that normally live in the nose and throat, to begin to overgrow. Mucus is also secreted within the middle ear space just as it is in the sinuses. Nasal congestion from a cold or influenza is very common and an inevitable part of childhood. 3 out of 4 children experience ear infections (otitis media) by the time they are 3 years old. Ear infections are the most common illnesses in babies and young children. If left untreated, these problems can become more serious possibly even causing hearing loss. A clogged nose can hinder breathing make them feel jaded and may lead to more serious health problems concerning the ear nose and throat and the respiratory tract. Therefore it is very important to keep the nasal cavity clear. The removal of secretion from the nasal cavities will accelerate recovery in case of sickness, improve breathing and general well-being, and help in the prevention of illness. The nose can be cleaned only with the help of a nasal Aspirator. The Baby Vac Nasal Aspirator was designed to provide a consistent controlled suctioning device using the suction from a common household vacuum cleaner. The Baby Vac will safely, quickly and very effectively clear the nose. The handling of the BabyVac is easy and straightforward. Being transparent, it is easy to observe the removed mucus and easy to clean. 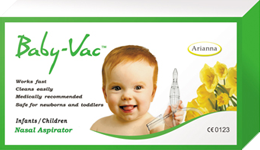 The Baby Vac has been tested and approved by clinics and doctors worldwide. The Baby-Vac® improves the respiratory condition, as well assisting in the prevention of infection. Here at The Organic Compounding Pharmacy we carry the Baby Vac aspirator. 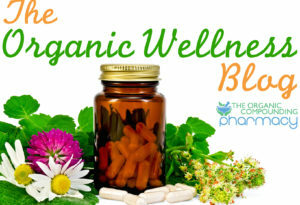 We are a strong believer in this product (even our family members use it). If you have any questions, please don’t hesitate to ask.